I read an article that discussed the reasons for McCain’s drop in the polling numbers. It offered me no real new insights, but reiterated the fact that McCain’s campaign went downhill with the Dow. While Wallstreet suffered an economic meltdown, McCain suffered its political equivalent. As Dan Schnur (one of the authors of the article mentioned before) put it, “[t]he worst month for the Dow Jones industrial average in more than a decade made McCain’s national security credentials almost irrelevant to voters frightened about their economic futures.” And we can look to Maslow to tell us why. Maslow — an American psychologist — gave us a theory of needs. These needs were placed heirarchically, from the most basic needs to the least. Basic needs simply meant that it came first before everything else: if a need was basic, you’d have to satisfy it before moving on to the less basic ones. 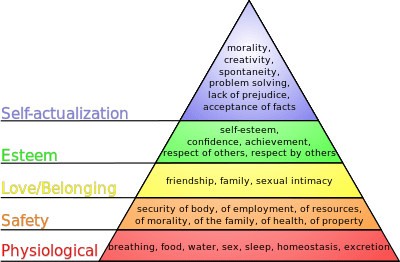 When the economy does well, people are less concerned about money; and money, according to Maslow’s hierarchy, would be right at the bottom of the hierarchy, meaning that it’s the most basic need that anyone could have. This perception is arguable, as money can have its effects all over the hierarchy, but when money is potentially very scarce, people are worried that they may no place to sleep nor any food to eat. Obama addresses these needs. McCain, on the other hand, is strong on security, which, unfortunately for him, is on the next level up. People are more concerned meeting every day needs than they are concerned for security — if people have got nothing to lose, they will be prepared to lose everything. McCain’s other strength lies in foreign policy, which arguably rests at the top of hierarchy — self-actualisation. Where people have got no more needs to satisfy, they will turn to solving problems beyond themselves — turning to things like altruism. I think that this election just shows how even very major decisions are influenced largely by luck. I just cannot find it in me to fault McCain on the campaign he has run (that is, until Palin came into the picture). And kudos to him even if he loses.